There is something therapeutic about a new pair of shoes. If you follow me on Facebook and Twitter you know that I just got a a new pair of shoes from Barefoot Tess. If you haven’t noticed already, I love Barefoot Tess. I think it is amazing how they are making such great, on trend shoes in large sizes available to fellow Junoesque ladies like me. I mean we need shoes too, right? The shoes I ordered were the Blowfish ‘India’ wedge bootie in Black. They were featured in my Fall Must Haves: Shoes post I did a while back. Simply put, they are a fabulous pair of shoes. As Barefoot Tess put it on Twitter: they are “the perfect combo of laid-back casual & feminine glam”. I could not have said it better. India is a lace-up wedge bootie that looks like a work boot but much, much cuter with a little Victorian edge thrown in for good measure. It comes in 2 colors: Black and Earth in sizes 11-14. I love wedges because you get the height (not that I need it, but you get my point) of a heel but without the pain and instability. These are no exception. These 4″ wedges are very stable and very comfy. I could literally wear them all day. The entire shoe, even the inside, is covered in a soft fabric that feels like velvet but I don’t know if it really is. (I know, very informative. Don’t judge me.) The shoe also has a rubber grip sole. So there will be no unfortunate slip-ups or stumbles. Because we all know that we have a long way to fall so any precautionary measures we can take, the better. I ordered a size 13 which I always do when I order online unless I know for sure that a 12 will fit. I am not quite a 13 but sometimes 12’s are too tight so at least with a 13 I know I will have room. Sometimes they are too big but that is a risk I am willing to take. I read other reviews of the ‘India’ on BFT’s website and they say that the shoes run a little narrow but like I said I always order the 13 to play it safe and the “India” fits perfectly. Not too loose, not too tight. I can even wear them with socks. You can wear the ‘India’ with jeans, leggings, dresses, anything really. And I plan to. I can definitely tell that ‘India’ is going to be one of my new favorites. Do you have any shoes that you are just loving this season? Share below! 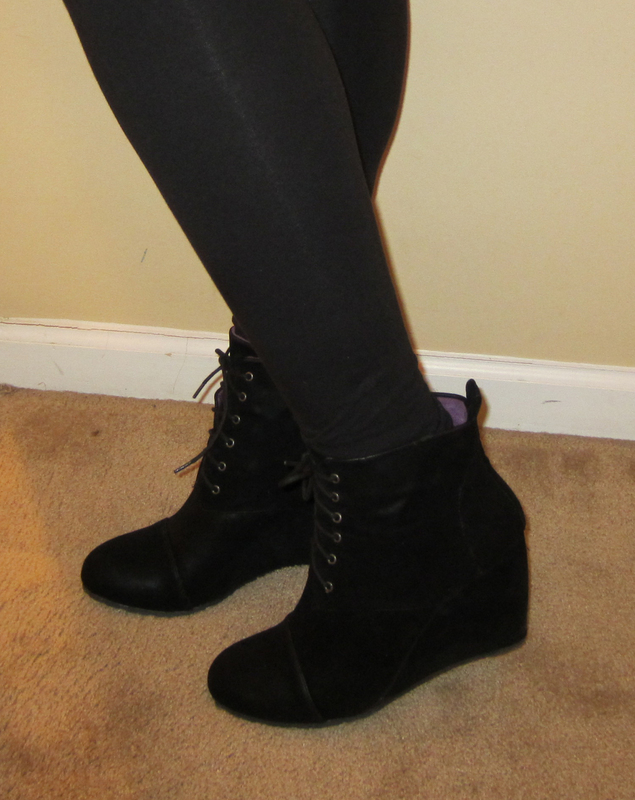 I really like that wedge bootie. I wear a size 12.5 shoe but because they don’t make half sizes past a 10.5, I typically order a size 13. Now if the shoe comes in a wide width, I can get away with wearing a size 12. BTW, great site! I have this weird pessimistic paranoia that if I order a 12, even in a wide width, they will be too small. So I usually just order a 13. Thanks so much, I’m glad you like it.